Two moonstone measure approx 5mm and the central stone measures 10mm. Each stone is set in beautifully patterned silver and are all linked together with silver links. The silver chain itself is nice and light and floating and has a lovely delicate feel to it. 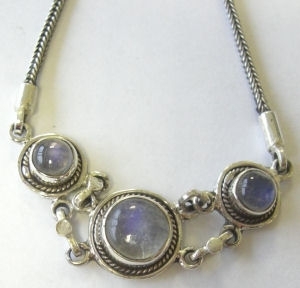 Moonstones are a protection stone, used for land & on the seas. Stone of the goddess Diana considered to bring love and passion to a relationship.